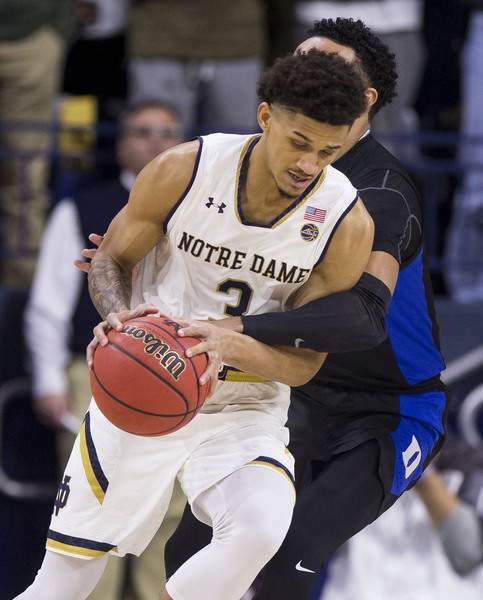 Associated Press Notre Dame's Prentiss Hubb tries to keep the ball from Duke's Tre Jones during the first half Monday night in South Bend. Associated Press Duke freshman Zion Williamson dribbles past Notre Dame’s Dane Goodwin during the first half. SOUTH BEND – The greatest show in college basketball visited Purcell Pavilion on Monday night. No. 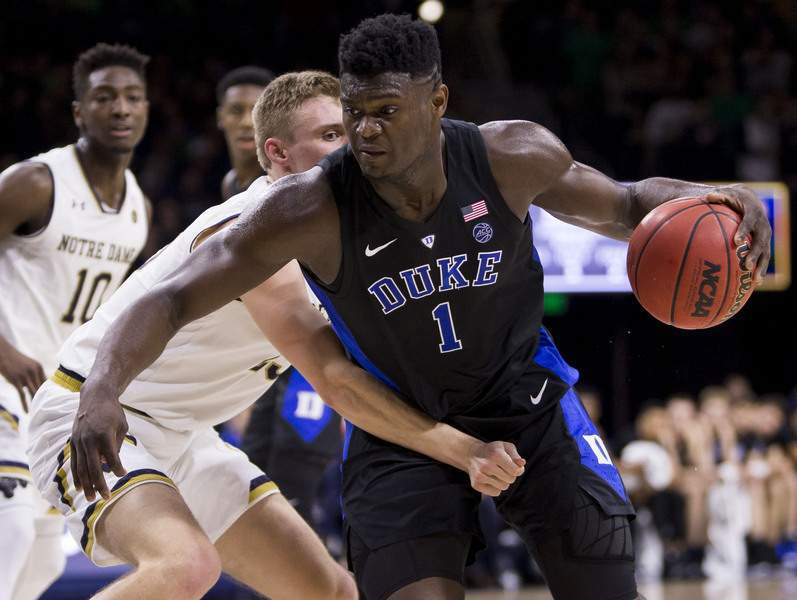 2 Duke and its group of absurdly talented freshmen led wire to wire, getting 26 points from Zion Williamson and 17 points and nine rebounds from R.J. Barrett to win 83-61 and send Notre Dame to its fifth straight loss in front of an announced crowd of 9,149. John Mooney led the Irish with 14 points and 11 rebounds, though he shot just 4 for 15. It was his seventh straight double-double and he exchanged some less-than-friendly words with Williamson under the basket after the Duke freshman fouled him hard on a breakaway. Duke (18-2, 7-1) jumped in front from the opening tip and led 17-2 less than six minutes into the game. Of those first 17 points, nine came from Williamson, who showed his versatility by scoring on drives, post moves and a jumper in short order. The 6-foot-8, 285-pound Williamson was the star all night, showcasing the ability that is causing multiple NBA teams to lose purposely in the hopes of drafting him this summer. He went 10 for 12 from the field and added nine rebounds. Though he didn't have any of the highlight-reel dunks for which he is best known, he did contribute several hyper-athletic blocks, including one in which he guarded Prentiss Hubb on the perimeter, kept the much smaller guard in front of him, and eventually rejected a jump shot. Notre Dame's best stretch came midway through the first half, when Hubb drilled a 3-pointer and D.J. Harvey added a flying layup as part of a 7-0 run that sliced the Irish deficit to 32-23. It was a short-lived run, and Williamson ended it with a nifty drive to the rim for a layup. By halftime it was 46-28. The matchup against Duke was the second against a top 5 team in three days for Notre Dame after its loss to No. 3 Virginia on Saturday. The Irish lost the games by a combined 49 points and did not lead at any time in either. Despite the second straight lopsided loss, Brey thought his team was much more competitive against the Blue Devils. “We're disappointed we lost, but we competed and battled,” Brey said. “And we needed to, because we weren't happy with that on Saturday (against Virginia). I told our guys I think we had the two best teams in the country roll through our building in the last couple days.